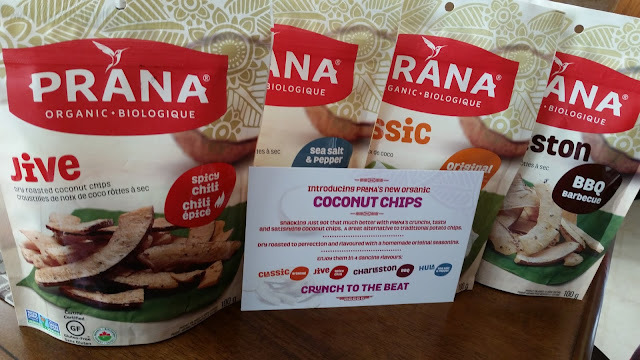 Prana Organic sent us some samples of their new coconut chips to try out, Prana's coconut chips are GF Certified, non-GMO but most of all pretty tasty. I look coconut to begin within, so they really didn't have to twist my arm to try these out. I thought these were going to be your standard coconut chip/coconut bacon that everyone has been selling, but these are truly more like a chip, sliced in thin moon shapes, and made crisp. What makes it even more of a chip is the seasoning they come in, spicy chili, sea salt and pepper, BBQ and original. I didn't want to spoil them and open all the packages, so I tried the original and sea salt and pepper. The seas salt and pepper was a nice surprise to an already tasty food. I can't wait to crack up the BBQ and spicy chili when I get the chance. You can find Prana products at most natural and organic food stores. We've also seen Prana products at Costco!